It presents exactly the same page, perfect formatting, on every computer that has a reasonably current version of the program (HWP 2005, 2007, 2011, etc). This is NOT true for MSWord - the same document can look very very different on different computers. Most Korean users know lots of functions in HWP, which means they can more quickly create tables, etc. Newer versions of HWP usually include a quick PDF creator, and you can save HWP files as MSWord or RTF (but then you lose the benefits of the first item, above). However, almost no computers outside of Korea have this program. And the HWP PDF creator includes some Korean data that can be strange on non-Korean computers. The spell-check is less effective (in English) than MSWord, and it doesn't have a grammar check. 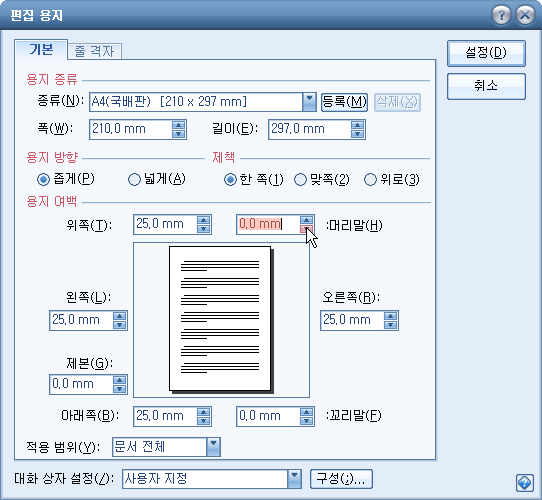 (see http://rjdickey-write.blogspot.kr/2012/06/msword-grammarcheck-settings.html) The default settings for HWP are peculiar for English writing, also. Use a different PDF creator. Of course, if you have Adobe Acrobat or Adobe Distiller or Ghostscript or something like that, you can use that. If you have the choice, tell it to embed the fonts. One option here is PDF995 (from http://pdf995.com - a free download (two files are needed) that you can save on your USB and use anywhere, since you need not reboot the computer after installation. It will produce clean PDF files and not add any "malware" to the computer. With the free version you will get one popup advertisement with each file created, or, pay US$9.95 and have no popups. Linespacing between 100 and 115 - the default in HWP is 160, which looks good for Hangul characters or a draft (so you can mark changes easily) but looks like 1.5 linespacing in English -- too much gap between lines for a final version. Of course you will need to highlight text to change the linespacing if you have already started typing.